From childhood to adulthood, Hot Wheels continue to be a part of nearly every car lovers life. For many of us, our love for cars started off with a vast collection of Hot Wheels. From the track sets to the miniature car washes, Hot Wheels are the source for many childhood memories. Even to this day, there&apos;s a huge group of enthusiasts who collect and trade Hot Wheels cars at annual conventions and online. 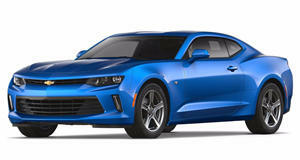 And now, Chevrolet has unveiled their Camaro Hot Wheels Concept at this year&apos;s SEMA show in Las Vegas. Inspired by the Custom Camaro Spectraflame 1:64-scale toy model, the project was a collaboration between the General Motors Design studio in Michigan and the Hot Wheels Design Studio in California. The final result is a Camaro that features flat-black graphics, red-line wheels and that amazing metallic-green paint job. Truth be told, it really does look like a full-size Hot Wheels. The original Hot Wheels toy cars had metallic Spectraflame finishes, so it was vital for the design team to replicate this chrome-style finish with its tinted top coat over a shiny base. They began by applying a primer coat and then sprayed it with a liquid-metal solution that created the mirror-like chrome base layer. The next step was to add a green tint in several layers until the perfect shade was found. In addition to the incredible bodywork, Chevrolet has also done a solid job of performance enhancements, such as Brembo brakes, a suspension lowering kit, and a new exhaust system. Power comes from the 6.2-liter LS3 V8 mated to a six-speed manual transmission. There&apos;s also a ton of unique Hot Wheels badges throughout the car, including on the decklid, front grille, quarter panels, and sill plates. In addition, Hot Wheels will be offering a collector&apos;s edition 1:64-scale model based on the full-size concept. All told, this is the 18th 1:64-scale Hot Wheels Camaro produced since 1968. Chevy always waits for the new Mustang, then upstages it. Reason five: They don't try and kill every spectator they see at Cars & Coffee.